We welcomed familiar and new faces to our annual membership meeting, held May 2 at A.E. Finley Center for Education and Research in Historic Yates Mill County Park. Join us for our fifth annual Chickin Pickin’! That’s good eatin’! 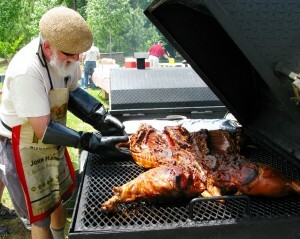 Pitmaster Jim Kellenberger with his masterpiece at our first Chickin Pickin’. Spring has sprung, and that means it’s time for Yates Mill’s friends and barbecue fans to get together for our annual Chickin Pickin’. This year’s barbecue will be held Saturday, April 2, from 3 pm to 5 pm. We’ll be at the park again – specific location to be decided depending on the weather. Tickets for this delicious fundraiser are $25 (of which $20 can be deducted from your taxes as a charitable donation to Yates Mill Associates). The proceeds will help us build up our savings account to pay for the replacement of Yates Mill’s waterwheel, a big project that we hope to undertake within the next year or two. You can buy tickets at the park’s front desk, during our corn-grinding weekend tours on March 19 and 20, by contacting any member of the YMA board of directors or by sending an email to tickets@yatesmill.org. Each ticket will get you a heaping plate of freshly made pork and chicken barbecue, sides, Yates Mill cornbread, dessert, and tea or water. We’ll also have live music to help wash it all down. Bring your holiday gift list to Yates Mill! All the details on our sale. Click for a printable version. The holidays are getting close, and Yates Mill Associates is ready to help you make the season merry! Come to our annual holiday sale to pick up crafts, souvenirs, cookbooks and all the cornmeal you can carry. 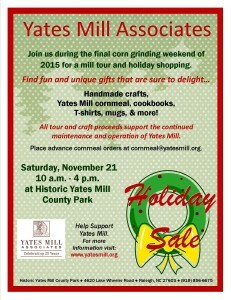 Join us from 10 a.m. to 4 p.m. on Saturday, Nov. 21, at Historic Yates Mill County Park. We’ll have plenty of yellow and white cornmeal ground on Yates Mill’s stones. You can buy some for your Thanksgiving recipes and stock up for Christmas gifts. You’re welcome to order your cornmeal ahead of time by sending an email to cornmeal@yatesmill.org. Just tell us how many bags you’d like of white or yellow cornmeal and we’ll have them ready for pickup. We’ll have an array of gifts including crafts handmade by YMA’s talented volunteers; Yates Mill souvenir mugs, T-shirts, hats and more; and cookbooks to inspire your cornmeal cuisine. You can pay by cash, check or charge card. Remember, all proceeds help us pay for mill maintenance and operation. Nov. 21 and 22 will also be our last weekend of corn-grinding tours at Yates Mill before we close down for the winter, so stop by the mill for a peek inside as we prepare our winter’s store of meal. But don’t get the blues – we’ve got more seasonal fun in store! On Friday, Dec. 4, at 6 p.m., we’ll join our friends at Raleigh Brewing Co. (3709 Neil St.) as they celebrate the release of their imperial stout, Miller’s Toll. Like all RBC’s beers, this award-winning brew is named in honor of a bit of local history: the “miller’s toll” is the price that a gristmill could charge for grinding grain, as mandated by North Carolina state law. On Saturday, Dec. 5, we’ll be back at the park to welcome Santa Claus, who will again join us inside Yates Mill to take pictures with all good girls and boys! Keep an eye on your email and our website for more details on this event. We hope you’ll join our celebrations! Loosen up your belt — it’s time for a Chickin Pickin’! 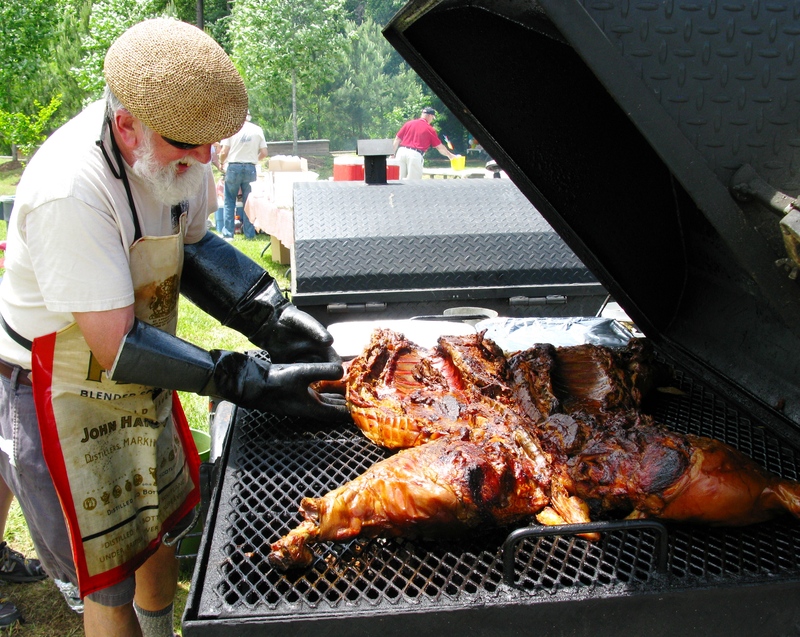 Welcome, spring — and welcome, friends of Yates Mill and lovers of barbecue! Everything you need to know about our fourth annual Chickin Pickin’. Click to view and download a larger version. Warm weather means it’s time to visit our favorite historic gristmill, take a walk in the park and get together for a delicious fundraising cookout. That’s right — the fourth annual Chickin Pickin’ is coming up on Saturday, April 25! 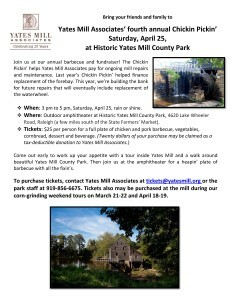 The barbecue is timed to start just after our regular Saturday tours end, so why not come out and enjoy a family day at Historic Yates Mill County Park? Tickets are on sale NOW through April 19 — you can pick up a pair at the visitors’ center at Historic Yates Mill County Park or by contacting us at tickets@yatesmill.org. Every penny of the proceeds from this event goes to Yates Mill Associates’ mission to preserve and celebrate historic Yates Mill. Our 25th anniversary year has been a remarkable one for Yates Mill Associates. This year-long celebration has given us an opportunity to take stock of our accomplishments, to honor and revitalize old partnerships, to engage new supporters, to come up with new ideas to expand our work, and to rededicate ourselves to our mission. 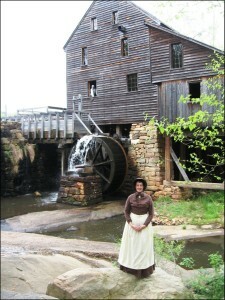 Removal and replacement of the forebay that carries water from Yates Mill Pond over the mill’s waterwheel. We know more significant repairs are on the horizon. We’ll need to repair of a massive beam that supports the primary drive shaft soon. Before long, we must replace the waterwheel itself. YMA’s board and officers are preparing now for these and other jobs, plotting repair timelines to avoid disrupting public access to the mill, and expanding our base of support to make sure we have adequate funds. 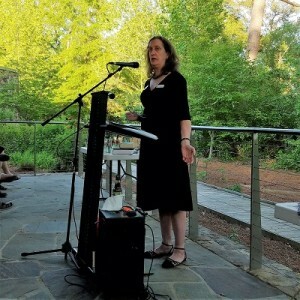 But even as Yates Mill Associates welcomes new partners and supporters, we still depend on the long-term friends who have made our work possible in our first 25 years. Will you join us in rededicating yourselves to our mission to preserve Yates Mill by making a year-end gift to YMA? You can donate securely online right here on our website – even set up an automatic monthly gift that helps you budget a bigger donation. You can also mail a check to Yates Mill Associates, P.O. Box 10512, Raleigh, NC, 27605-0512. Your support has helped us make sure that every visit to Historic Yates Mill County Park is a memorable occasion of learning, discovery and just plain fun. Please join us in keeping this tradition alive for another 25 years … and for many generations to come. Thank you, and happy holidays from Yates Mill Associates!